Whiteboards or dry erase boards are popular in schools, offices, and even homes. The idea behind dry erase boards is you can write on them with a dry erase marker and then wipe that marker off to start all over again. The problem is keeping the boards clean; as over time, the whiteboard begins to look dirty thanks to smudges and old ink stains. 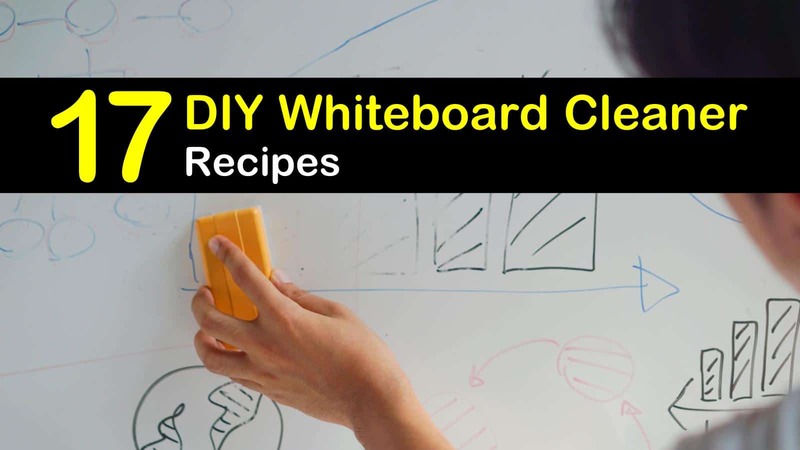 Using one of our DIY whiteboard cleaner recipes means that there is no need to buy a new board as you can quickly clean your old one. Sure you can easily run out and grab one of the ready to go cleaners to clean your whiteboard, EXPO makes a great cleaner, but it is expensive. There are several homemade cleaners you can make with ingredients you already have on hand that provide the same amazing results. When it comes to choosing a homemade whiteboard cleaner, not all cleansers are for the same purpose. Some homemade whiteboard cleaners work best on specific stains, while others are more for general cleaning. Know what you need out of your whiteboard cleaner to ensure you choose the best method for the job at hand. If you want a clean, dry erase board with minimal effort, give rubbing alcohol a try. Rubbing alcohol removes most leftover ink, including permanent marker stains as the inks become soluble. Pour isopropyl alcohol directly onto the end of the microfiber cloth. Rub the whiteboard until the ink comes off. For older or stubborn stains, spray the dry erase board with the alcohol, allow to sit until ink begins to dissolve and then wipe off with a dry rag. If you don’t have any rubbing alcohol or if it is not cleaning effectively, try using hydrogen peroxide instead. Apply the peroxide in the same manner. If your board has been a victim of permanent ink, getting it off can be a problem. One of the best ways to remove permanent marker is to use a dry erase pen and a dry eraser. Use the dry erase marker to color over the old ink stains and then immediately wipe away with a whiteboard eraser. This should remove both inks, but if any remains repeat the process. Abrasive cleaners may void your warranty, but generic white toothpaste won’t. The generic white toothpaste acts as a mild abrasive cleaner for non-porous surfaces and when used correctly won’t ruin the board. Squirt toothpaste directly onto the whiteboard; rub the area with a rag until stains are gone. With a clean cloth wipe the entire surface of the board. Ben-Gay can be used in place of toothpaste, plus it contains alcohol, so it has extra cleaning power. Combine one cup each of water and vinegar to create your own cost-effective, yet powerful whiteboard cleaner. Spray the cleaning solution on the board’s surface and wipe away. For extremely dirty or stained whiteboards allow the cleaner to sit on the surface of the board for several minutes before wiping with a damp cloth. The alcohol in hair spray works to remove old ink and dirt from whiteboards when used correctly. If not done the right way you will have a sticky mess that needs further cleaning. Apply hair spray directly onto the surface of the whiteboard and allow to sit for two minutes. Dip cloth in warm water and mild soap to wash away any leftover residue. You can use a commercial glass cleaner or one of our natural glass cleaner with vinegar recipes to clean your board effectively. The ingredients found in household glass cleaners dissolve various residues, including ink. Spray glass cleaner on the surface and wipe with a clean rag. After cleaning use a soft cloth to remove excess glass cleaner so as not to ruin the lubricating layer. Straight rubbing alcohol is not always needed to get a board clean. This recipe is perfect for when you need a little less cleaning power. Mix liquids inside a spray bottle. Spray your board directly and allow to soak for about a minute, possibly longer depending on how dirty it is. Do not let the cleaner dry. Remove cleaner by wiping with a dry rag. Restoring our dry erase board can be as simple as using an old dryer sheet. Rather than use a dry erase marker, use dryer sheets to wipe your boards daily. They are also effective at removing older smudges, but you need to scrub a little. Cleaning your whiteboard every day will help prevent future stains. Nail polish remover works like rubbing alcohol in cleaning dry erase boards. For it to be a useful cleaning product though, you need to use the right kind. Non-acetone nail polish remover will not work to clean whiteboard surfaces; only acetone-based will work. Dip a corner of the clean cloth into the polish remover and wipe the entire board. You can use a variety of household cleaners to clean your whiteboards effectively. One product you can use is LA Totally Awesome. Follow the directions on the label. After cleansing, apply two coats of car wax and polish by hand. The car wax fully restores your old whiteboards and works to block future stains. All-purpose cleaners that contain bleach can also work to clean and remove stains from your old boards. Put the cleaner directly onto the surface of the board and wipe with a washcloth dipped in hot water. Use a clean washcloth dipped in hot, soapy water to remove any cleaner. Rinse and wipe with clean water to get rid of remaining residue. Disinfectant sprays and other household cleaners should be used sparingly and with caution. The chemicals found in some of these cleaning supplies can erode the top layer of the whiteboard. Ink that has been left on the surface of a dry erase board for a few days is difficult to remove. Wipes, including baby wipes and antibacterial wipes, will work to remove day old ink. Scrub with the moist wipe until all ink has been eliminated, then throw away the used wipe. WD-40 does much more than clean off old marks on your dry erase board; it can also fully restore it so you can keep writing without the ink drying on the board. Use soft towels or a soft paper towel to remove as many marks as you can. Spray a little WD-40 directly onto the surface and wipe with a clean cloth. As the marks are removed, the WD-40 will leave the board slick enough to write on. Hand sanitizer and paper towels will also work well to clean a dirty whiteboard. Squirt hand sanitizer directly onto the whiteboard surface. Use the paper towel to spread the sanitizer around the entire board. Leave for thirty seconds, then wipe clean with more paper towels. Baking soda and water form a thick paste that cleans a variety of things inside your home, so why should whiteboards be any different. Mix baking soda and water to form a thick paste. Dip a paper towel into the paste and dab directly onto your board. Scrub with the paper towel until all markings are gone. Wipe clean with a wet paper towel and then dry. Rumor has it that black coffee will work to clean a dry erase board, as will coffee grinds. Dip a paper towel into black coffee and wash your board. For stubborn marks use a small number of coffee grinds to scrub off stains. Regardless of the method chosen, you need to follow up by washing with warm, soapy water to remove the brown tint left behind from the coffee. Hand lotion works to clean smudges from dry erase boards. Apply a small amount of non-greasy hand lotion to a clean towel and gently wipe across the surface. Polish with a clean, soft rag for a like-new surface. Restore your old, stained whiteboard with neutral shoe polish. Dab a small amount of no color shoe polish onto a soft cloth. Gently rub onto the various marks and stains. Polish board with a clean towel for a new looking surface. Thank you for taking the time to read our post on whiteboard cleaning tips; we hope you have found some of our cleaning solutions helpful. 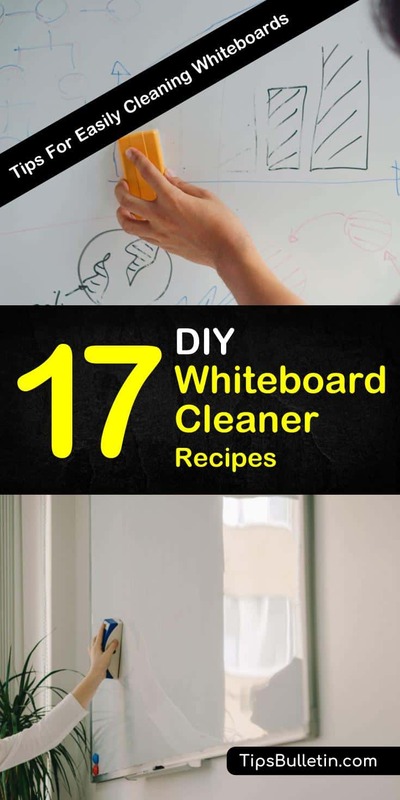 If you have found our natural DIY whiteboard cleaner tips and tricks useful, please share these homemade whiteboard cleaner ideas on Facebook and Pinterest so others can benefit.